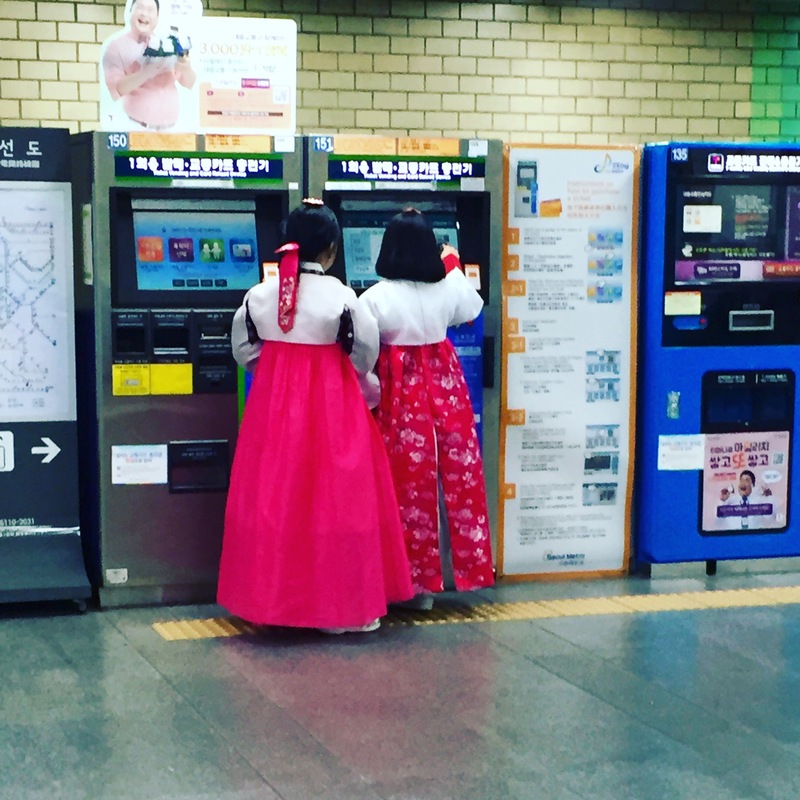 A two and a half hour train journey from Busan saw us arrive in Seoul, South Korea’s capital. After the Mediterranean-like warmth of Busan, Seoul was freezing. This city is huge: as a megalopolis, when combined with Incheon, Seoul has more than 23 million people. There is no way you can see even half of it in one visit, so you have to be selective. We were staying in an Airbnb apartment by Yangjae Citizen’s Forest, to the southeast of the city. On the map it looked to be near to Gangnam, but we soon realised just quite how big the city is, and how much travel time is needed to get around it (even with the efficient metro). Staying more central (near to Hongdae district) is better if, like us, you only have a few days in Seoul. Yangjae was a great introduction to “real life” in the Korean suburbs. Our host, Haejun, kindly picked us up from the metro station and showed us how to operate all the electrical equipment in the apartment. As you’d expect, everything was high-tech, made by Samsung and made a lot of noise, from the keyless door which played a tune to let you know it was locked, to the washing machine which sung to you when it finished a cycle. The internet ran at supersonic speed. Phil found Premier League on the TV. Seoul was great! We went to the local EMart and bought spicy pork belly, pak choi and sticky rice to have a go at making our own Korean food. It was such a luxury to be able to cook for ourselves for once; most of the hostels in Asia don’t have cooking facilities like they do in Europe. Given the American influence in South Korea, we were even able to buy some bacon to cook for breakfast. It was streaky American bacon, and we didn’t have any HP Sauce, but it was the next best thing to go with a cup of tea as we consulted the maze of the Seoul Metro map early the next morning. 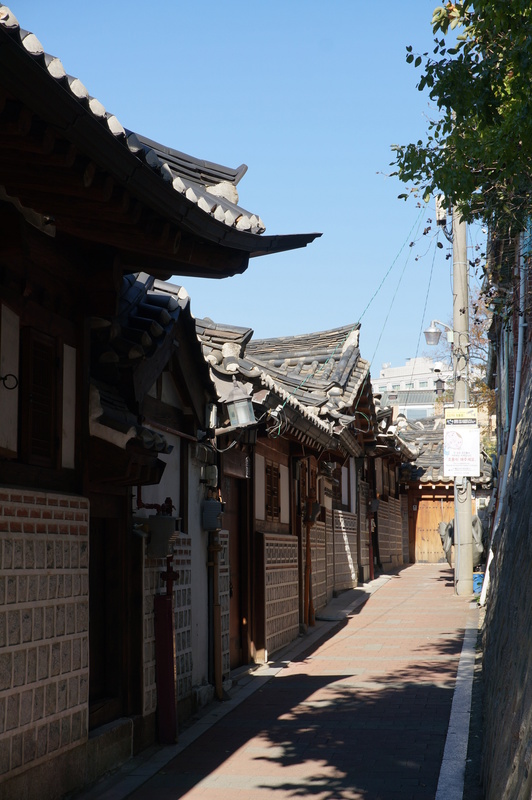 We started off our sightseeing in Bukchon to see the old hanok buildings and streets, winding their way up through the hillside. Bukchon is one of the last traditional neighbourhoods in Seoul that hasn’t been cleared to make way for glittering skyscrapers. These tiny streets have a big focus on traditional crafts – you can pay to take classes or to have your photo taken in traditional hanbok Korean dress. 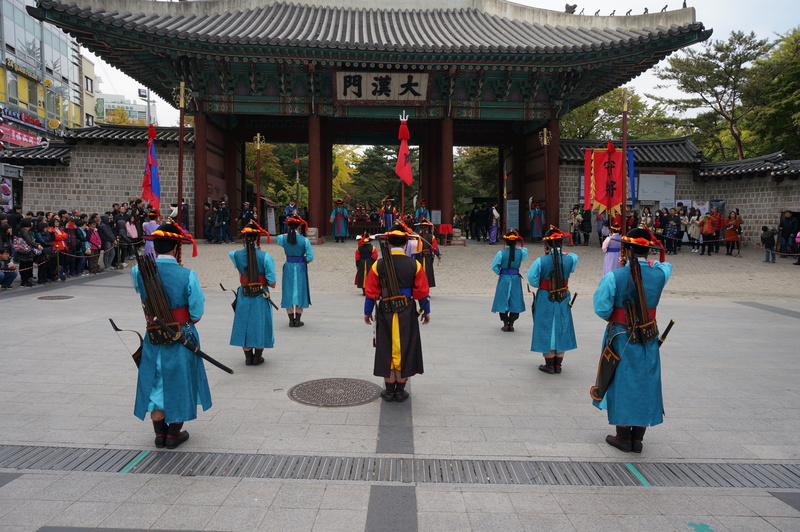 Lots of Korean visitors take the opportunity to wear national dress when visiting Bukchon. 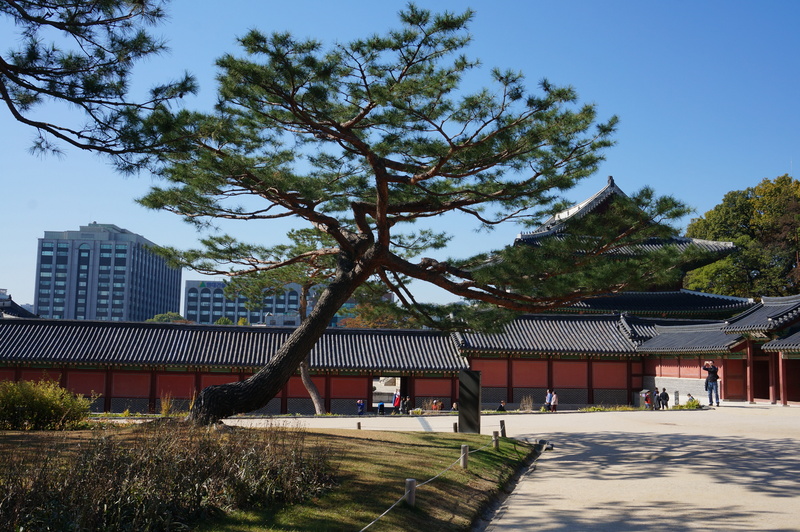 At the bottom of the hill stands the impressive Changdeokgung Palace. It’s definitely worth a look round the palace and gardens, though we didn’t pay the extra to see the secret gardens. To get to Bukchon, take the metro to Anguk Station, use Exit 2, go straight and follow the crowd. 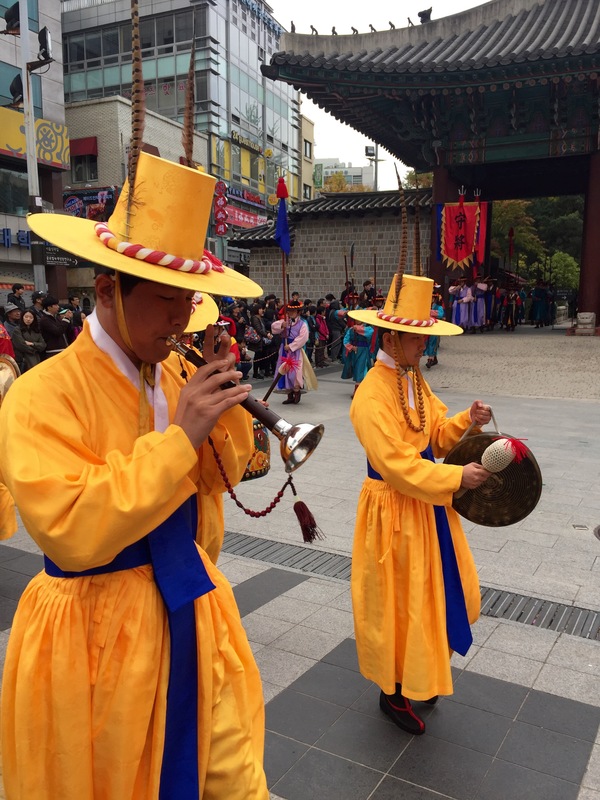 A little further away, a visit to Deoksagung Palace lets you hear unusual and traditional Korean musical instruments (including conch shell pipes) and see traditional dress during the changing of the guard ceremony. The 15 minute ceremony takes place each day at 11am, 2pm, and 3.30pm (City Hall Station, Exit 2). Korea loves its coffee, so much so that many popular areas have dedicated cafe streets. We headed to Hongdae, Seoul’s number one district for artists, musicians and designers, which has the highest concentration of coffee shops in the city. 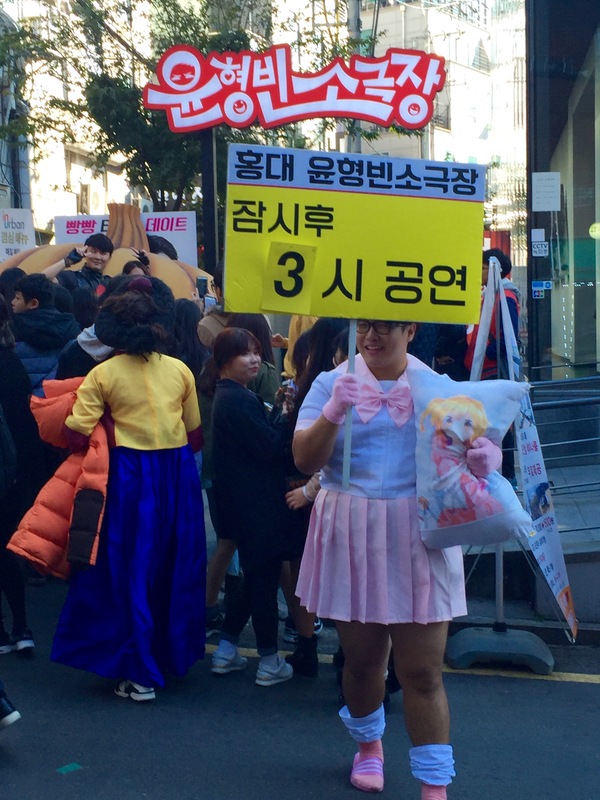 Hongdae has an art market every Saturday from 1-6pm. The stalls all seemed to be run by students from nearby Hongik University and sold mainly local crafts, along with customised baseball hats and clothing. We were interviewed by film students for their uni course whilst at the market, which helped us to learn a bit of broken Korean. Lots of food in Korea is quirky and fun. 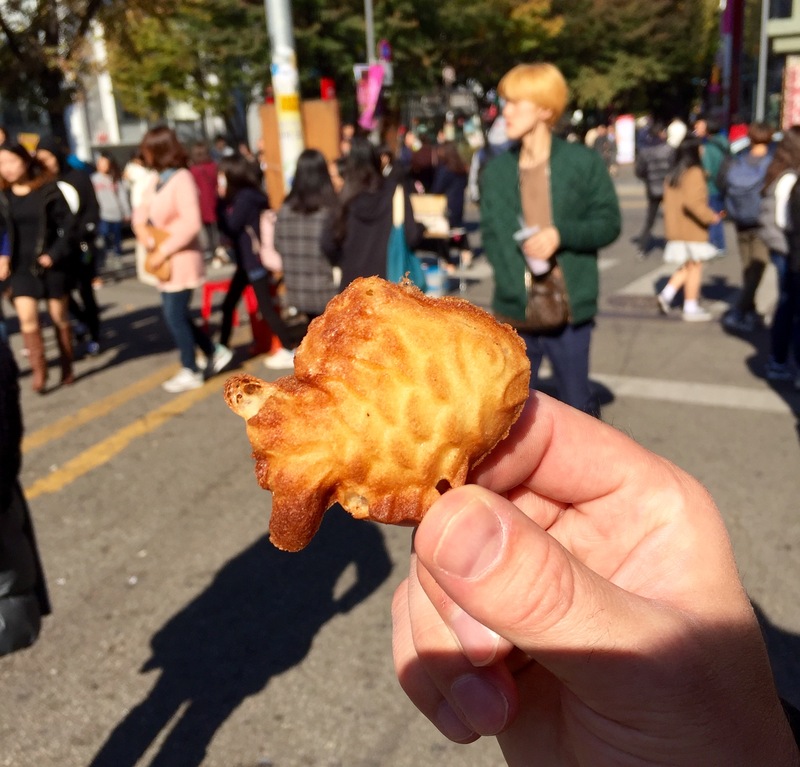 We tried some Bungeoppang, fish-shaped pastries filled with custard or red bean paste, from a street food vendor in Hongdae. The red bean paste was very similar to mushy kidney beans, but it was surprisingly sweet and worked well with the deep-fried batter mix. 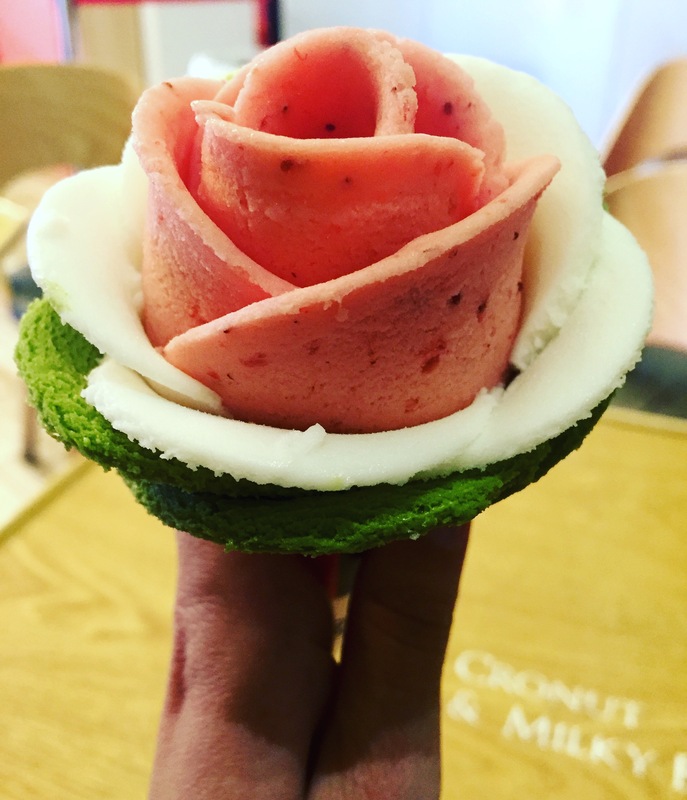 Milky Bee (near Myeongdong Station) serves one of the most imstagrammable desserts ever: rose petal green tea, vanilla and strawberry ice cream. 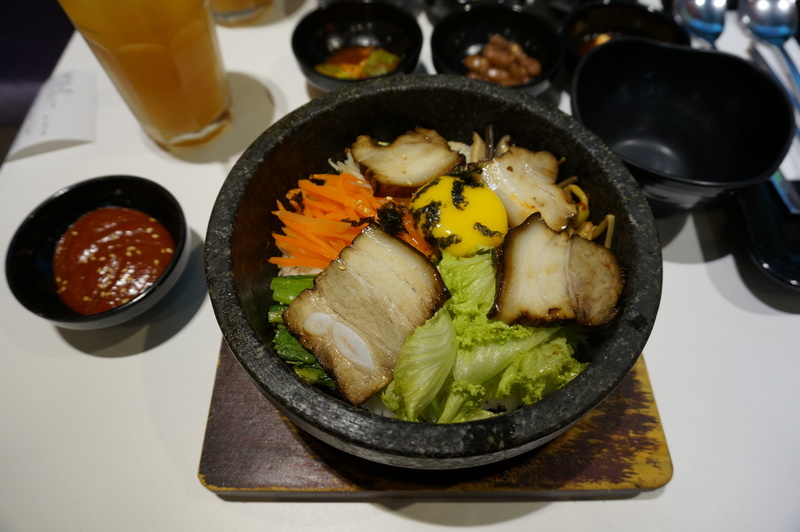 We really enjoyed one of Korea’s most famous dishes, bibimbap, which literally means “mixed rice.” Bibimbap is served as a bowl of warm rice, sautéed vegetables and gochujang (chilli pepper paste), as well as sliced meat (usually roast pork, spicy beef, or spicy pork), topped with a raw egg. All the ingredients are stirred together before eating, making the rice at the bottom of the bowl slightly crispy and egg fried. Deliciously spicy and warming against the cold Seoul weather. After all that food, we took a walk along the Cheonggyecheon Stream, which runs across the city. Art installations spring up along the footpaths and different festivals are held here year round. 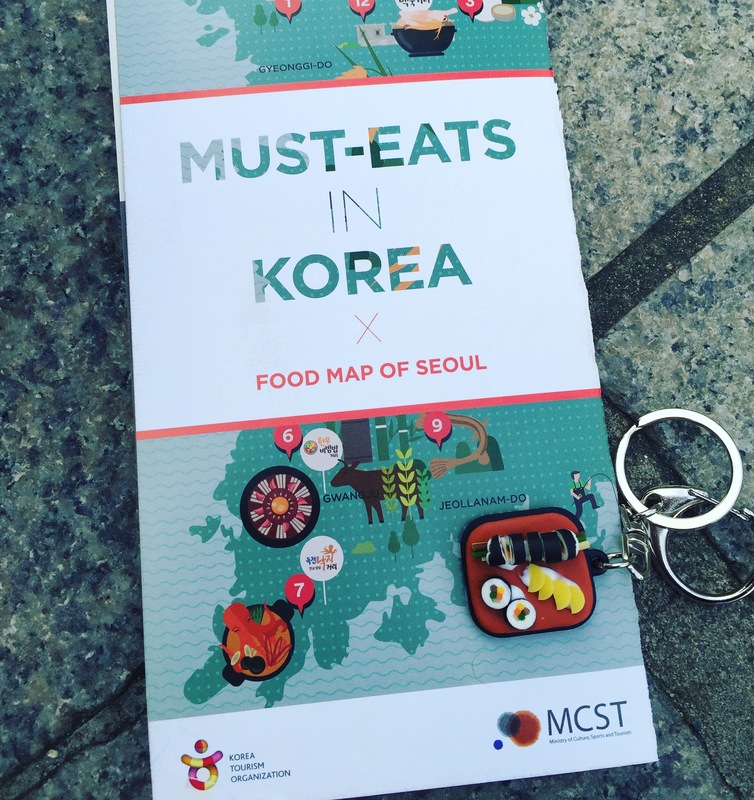 We stumbled upon the Seoul Food Festival, where fittingly we got to make our own Korean food keyrings, for free! We ended our time in Seoul like a true Korean, with a visit to a BBQ restaurant in Gangnam. We didn’t get to see Psy but we did get to see just how busy Gangnam is on a weekend – the atmosphere was fantastic! Think lots of bright lights, K-Pop (Korean chart music), sushi shops, and fried chicken and kimchi stalls on every corner.